Friday's Symposium on "The Effect of Multichannel on Radio Operation" was a huge success with more than 170 attendees. The AES 116th Convention opened on Saturday with much excitement and large crowds visiting the 259 companies that were exhibiting at the show. This was a larger number of exhibitors than in Amsterdam, plus the visitor attendance was up by 10%. 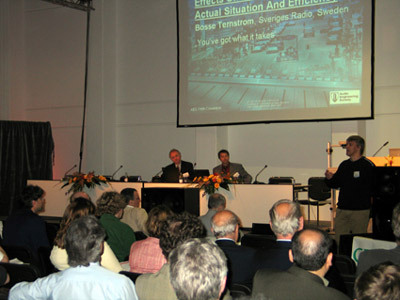 The 116th Audio Engineering Society Convention will take place at Messe Berlin, Berlin, Germany, Saturday, May 8 - Tuesday, May 11, 2004. 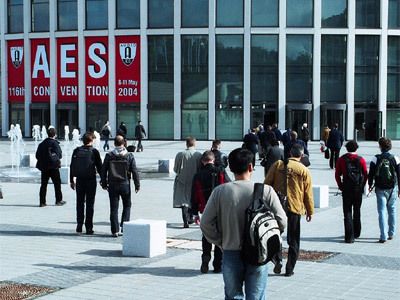 The South entrance will lead visitors into the exhibition area in halls 2 and 4 and to the conference program in hall 7. There will also be a one-day Symposium on Friday, May 7 titled "The Effect of Multichannel on Radio". This preliminary program is designed to help you plan your trip to the 116th AES Convention. As hotel rooms at the AES special rate are limited, you may wish to book your hotel room now. The calendar of events is available as a downloadable Excel file, by clicking here. This calendar (in Excel) includes drop down boxes which contain details of the sessions. If Microsoft Excel is not installed on your computer, you may download a free Excel viewer from the Microsoft website by clicking here. The size of this downloadable file is 4 MB. A PDF of the calendar is also available. NOTE: The calendars and all other information on this website will be updated from time to time. Added for your convenience is a 4-page Convention Planner, which contains all information on a day-to-day basis, allowing you to plan ahead in an easy fashion. You can download this PDF file by clicking here. Information is now available on hotels. Click here for guidelines for 116th poster presentations. Papers, Workshop and Tutorial Seminar Presenters - if you have not provided your facilities requirements please click here.